Welcomed with broad smiles by Anandram Bhobaria and his brothers, it was very gratifying to find that I was remembered, by a family of durrie (rug) makers of the tiny village of Salawas, whom I had befriended at least 20 years ago. I was on a mission to buy a rug and 2 matching cushion covers, as a gift for my daughter— but only if I could afford it! Salawas, located just 22 km and a half hour drive away from Jodhpur, is certainly a place worth visiting. I was keen to see how the Bhobaria family’s small business of rug-making had become Anandram Bhobaria Industries. Now it not only excelled in rugs, it was also the best known supplier of tentsin India and abroad—complete with rugs, curtains and all the other necessities required in a tent. Their small beginnings had grown into an industry; from that one single family, the village was now full of durrie-makers. Almost a hundred families with technical skill and ability hard to match, translated designs into durries. These rugs are so special that ne might refer to them as collector’s items! While their style of making durries may look primitive in these days of machine-made rugs and infinite varieties of floor covering available in the market, the traditional Indian durrie is hard to match. Interestingly, thanks to interior designers one often sees the humble durrie making its mark at newly designed homes, offices and even 5-star hotels! Placed strategically, the durrie is an inexpensive and convenient way to brighten up a dull corner. Some of the newer durries from Salawas in Rajasthan are also so outstanding in design and colour, that whole rooms may be designed around them. For the past two decades foreign buyers have shown keen interest in the potential of these attractive rugs, and even when there has been a slump in the export of carpets the durrie market seems to be doing well. 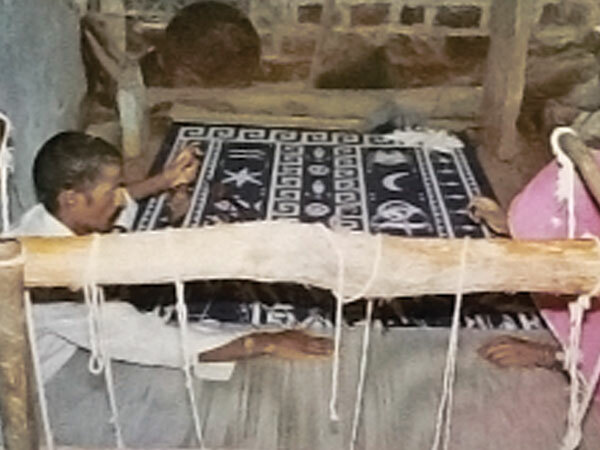 Anandram Bhobaria and his brothers, undoubtedly the best-known weavers of Salawas, belong to a family of traditional weavers. Their father and grandfather are known to have woven coarse fabric on their looms for local usage. Side by side they also made a few durries in camel hair, goat hair or coarse wool, just before the winter months, which were then bought by the villagers to either sleep on or to double up as a blanket or shawl on cold nights in the desert. According to Anandram, designer Shyam Ahuja had discovered him in 1980 and persuaded him to devote all his time to making durries only for him. Anand agreed and worked exclusively for Ahuja for seven years. In the process he experimented and learnt to use of chemical dyes, so much so that he decided to give up the traditional vegetable dyes of earlier generations. This may be considered the real start of durrie-making in Salawas. From being just one family, durrie-making spread through the entire village, and there are now almost 80 families, all involved in this trade. Anand himself, his two brothers and their wives are skilled durrie makers. The weaving is generally the work of the men and young boys, while the women of the family look after the washing and drying processes. For Anand, the introduction to western pastel colours was an eye-opener. The foreign chemical dyes, created shades that he had never seen before and made the durries colour-fast. The vegetable dyes that he had earlier used, had the disadvantage of running, even after repeated washes, and also proved more expensive. The durries made at Salawas, fall into the ‘Panja Dhubri’ category of durrie-making. Anand now has 60 looms and 150 workmen involved in the various processes, working under him. Depending on the size, upto three persons may work collectively, in weaving one durrie. The largest size that they make is 15’ x 30’, but Anand says that larger ones can also be made with a loom fashioned specially for this. The maximum demand is for the 5'x 8' and 6'x 9' durries. These sizes one usually popular for living rooms. A 4'x6' size can be used as a diwan cover and a 3'x5' as bedside rug. Mini durries are also made, and a 2’x3’ may be used as a wall hanging or doormat. Cushions to match durries have also became popular and squares of 18"x18" are made for this purpose. The colour palette has also changed with demand, and the cool pastels, such as peaches and turquoises are now giving way to warmer beiges, mustards, greens and browns. Many of Anandaram’s new durries are being marketed both locally, and exported to US and many European countries. Orders now come directly to Anand as these special clients, want their designs to be kept totally exclusive, and not shown to competitors, or released to the local market. The weaving of the durries, is followed by a complicated process of washing, before they are ready for despatch. Each durrie is first washed in plain water and liquid soap sprayed on it while it is still on the loom—it is than rubbed with a stone for the popular ‘Stone Washed’ look. Chemicals are then applied to the durrie, five times and washed off thoroughly each time, thereby ‘Fixing’ the colours. The durrie is stretched on a frame and allowed to dry, and is then finally considered ready. With current fashion trends, the durrie has come into its own, and is rapidly replacing carpets in many modern homes. Cheaper and easily washable, durries are now available in any colour under the sun. Wherever they are spread, the Salawas durries can be counted upon to become the cynosure of all eyes. The Indian Durrie that became India’s fashion statement of the 90’s, continues to flourish. And yes, the rug and cushion covers that I had come to order, were delivered to me in time for my daughter’s birthday!